Saturday was a glorious day. Sunny, cool, breezy, and dry. 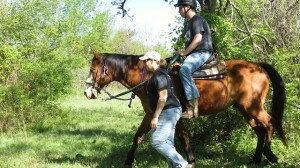 At All-Star Therapy Group, Logan got to ride out across the pasture and through the woods for the first time this year. 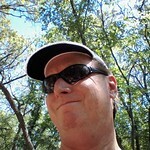 Of course I came along to document the event. The new green of Spring is great. 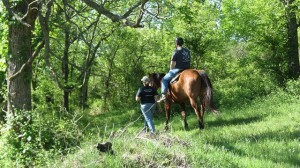 Everything is very lush right now right now in northeastern Oklahoma. As one heads west it dries out quickly and there have been several big grass fires not too far away. 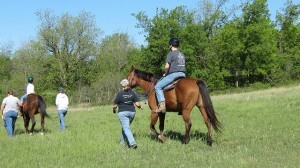 But on Saturday we were just enjoying the riding and walking through the pasture and woods. When was the last time you went on a walk through the woods? This entry was posted in Horseback Riding, Horses, Logan, Oklahoma, Spring, Therapeutic horseback riding, Therapy on May 7, 2014 by Alan Bates.